We are one of the leading Manufacturer and Exporter of Floor Cushions. 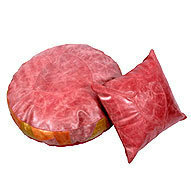 This thick and soft red 16X 16 floor cushion is great for outdoor use. A reliable name to do business with, P.G Enterprises Pvt Ltd., Manufactures and exports high quality leather furnishing, soft furnishing and leather products. Our products are designed keeping in mind the contemporary lifestyle and customer's needs. The manufacturing process is carefully monitored at every level, with special attention being laid on color, finishing and embellishments. Attractive and original in design, our products are the outcome of our dexterous workforce and a state-of-the-art infrastructure. Our quality conscious approach and penchant for innovation has made us a name to reckon with, and won us a long list of patrons.